Under the ADA, all public and government facilities are required to comply with specific use and construction requirements to accommodate disabled individuals. It is important to note that the ADA applies only to “public accommodations.” Therefore, a HOA will not be subject to the ADA unless the HOA is operating what can be considered a “public accommodation.” A “public accommodation” is any facility which a HOA is holding out for use by members of the general public–not solely for use by the HOA’s members and their guests. Though these situations are rare, HOAs have been subjected to ADA requirements when: (1) a HOA allows members of the public to buy memberships or passes to the HOA’s pool, (2) where a HOA allows schools, church groups or clubs to use HOA facilities on a regular basis, and (3) where a HOA maintains a rental office on the property that receives regular visits from the general public. Any HOA considering or currently allowing such activity should carefully inspect their facilities to ensure compliance with the ADA or, in the alternative, cease all such activities immediately. The failure to do so may lead to claims of discrimination against the HOA and otherwise subject the HOA to liability. 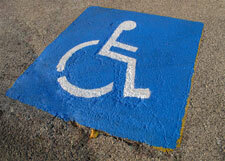 The FFHA is similar to the ADA; however, the FFHA applies directly to housing facilities, including HOAs. Under the FFHA, a HOA may not legally refuse to make reasonable accommodations in its rules or policies when such accommodations may be necessary for a disabled owner to fully enjoy and use her unit. An example would include when a disabled owner requires the assistance of a service animal; a HOA would be obligated to grant a waiver from its “no pets” rule. The HOA ‘s refusal to make such an accommodation (one that is reasonable and necessary to afford a disabled owner the full enjoyment and use of her unit) is deemed to be discrimination under the FFHA. The FFHA also requires HOAs to permit a disabled owner to make, at such owner’s expense, reasonable modifications to the owner’s unit and HOA common areas. This requirement is also codified in California Civil Code Section 1360. Civil Code Section 1360 requires HOAs to allow disabled owners to make modifications to their units and HOA common areas at the owners’ expense in order to accommodate the owner’s disability. Examples of such modifications may include power stair lifts, ramps or handrails. Under Civil Code Section 1360, a HOA must allow an owner to make modifications to her unit and the route to the unit from a public way, so long as (1) the modifications are consistent with building codes, (2) the modifications are consistent with the intent of the governing documents relating to safety and aesthetics, (3) the modifications do not prevent reasonable passage by other residents, (4) the modifications are removed by the owner when the unit is no longer occupied by the disabled individual, and (5) the owner submits plans and specifications to the HOA for review. Accordingly, the HOA may require (1) the submission of plans for the modifications in order to ensure consistency with the overall design of the neighborhood, and (2) the execution of an agreement that the owner return the property to its original condition upon leaving the property. A HOA may be subjected to these laws in certain circumstances, including when a HOA opens its facilities to members of the public or when a HOA receives an accommodation request from a disabled resident. A HOA may be required to make reasonable accommodations in its rules and policies, or otherwise permit architectural modifications to a disabled owner’s unit and HOA common areas at such owner’s expense. HOAs that have received a request for modifications, or are granting members of the public access to HOA facilities, should contact their legal counsel to determine the HOA’s rights, obligations and liabilities.